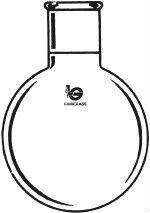 50ml Capacity Round-Bottom Flask with 19/22 joint and short neck. Note: picture is representative and not to scale relative to size. Made of borosilicate glass. This item cannot be shipped Priority Mail.